The parents of this lovely Lacecap variety were found growing on the wooded slope of a Korean mountain, which explains its exceptional hardiness. It produces delicate clusters of light blue flowers that last for several weeks in early to midsummer (July here in Connecticut), turning a stunning deep crimson as they age. Fall foliage is an attractive shade of burgundy. Excellent in a shady border with Ferns and Astilbes. 'Blue Billow' is a reliable bloomer through Zone 6, and adventurous gardeners in Zone 5, where flowering occurs 3 or 4 years out of 5 may also wish to give it a try. It performed well at our nursery in full sun. Blooms on old wood. 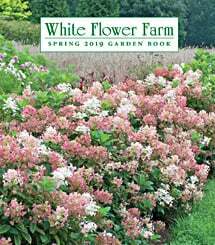 For more information on Hydrangea care, click on Growing Guide. Hardy on Cape every year since I planted it 25 years ago - other hydrangeas have proved easily damaged in the winter. Be sure your soil is acid and if the blooms are not a superb blue, then add dust with sulfur in the late to make the soil more acidic. My Blue Billow is 16+ years old and still going strong. It blooms a true shade of blue just in time for Independence Day in my area and is a show-stopper. I've had so many contractors, public works technicians, and neighbors ask me about it. Many are surprised to learn it's a Hydrangea since they're so accustomed to the puffball blooms. I've had landscapers whack the bejeebers out of it but it always comes back, big and strong. In fact, it seems to benefit from the occasional hard pruning. It keeps its shape better and prevents it from taking over the whole border planting. Mine gets strong morning sun but is in full shade from noon until sunset. No matter - it blooms like a sun-lover would. Get this shrub. You will love it! I had high hopes for this plant as I love blue and always looking for suitable perennials to add to this color in my gardens. Planted this in a border which receive some sun and shade. This was to be its second season and it is also it's last as it has died. Very disappointed, but as a gardener I know we don't always succeed. However it was expensive and I would like to know if anyone else in the northeast has had a similar experience. This plant takes several years to get established. However, it is worth waiting for. My plant is surrounded by bleeding hearts and shares space with a lavender azalea. It's neighbors are all done blooming for the year, but it is just coming into bloom (June 21 in central Maryland). A great plant to supply summer color to a shady garden. Last spring I sent away for two of these from your company. They were packed nicely and on the small size but WOW in ONE YEAR did they grow, have tripled in size. Last year only one bloom, this year numerous blooms. Love the compact shrub type growing habit. Enough of this, lets talk flowers: the photos of the flowers do not do it justice, the parts in the middle and unopened parts are almost like a shiny type of fuzzy. Amazing. Am so very glad I took the chance and sent away for these. Will buy more as I am slowly adding various species of hydrangeas to my yard and want more of these. They are growing in poor soil, receive about four hours of direct sun from noon - 4pm Dappled sunlight in morning and shade after 4pm. They do NOT wilt like big headed ball varieties. Fertilizer/Soil and pH: In some varieties, flower color is determined by the pH of the soil; at low pH (acid soils) flowers will be blue and at higher pH, flowers will be pink. Generally, a pH below 5.0 results in deep, vivid blues and as the pH rises the flowers range from blue to lavender to mauve to a vivid deep pink at pH 7.0 (neutral). The pH determines the availability of aluminum in the soil; this element is more readily available in acid soils, and this availability results in the blue flower color. Since phosphorus ties up aluminum in soils, using a fertilizer low in this nutrient will aid in attaining blue flowers. If pink flowers are desired and your soil is acid, simply add lime to raise the pH and use a balanced fertilizer. Aluminum sulfate will lower pH if blue flowers are desired. Pruning: Little pruning is needed, but if shrubs grow too large, cut back stems by about one-third by the end of August. In spring, only prune out dead wood. Most Hydrangea serrata varieties bloom on old wood. H. s. Tuff Stuff™ is a variety that blooms on both old and new wood. If no fall pruning was done, stems can be cut back by one-third in spring if necessary—but this will sacrifice the bloom on the old wood and shrubs will not flower until late summer. Early Spring: Prune out any dead wood from all varieties. Check soil pH and adjust up or down if needed for desired flower color. Feed plants with a fertilizer high in phosphorus (such as 15-30-15) to encourage blooms. Complete any transplanting before leaves unfurl. Summer: As soon as blooms fade, remove old flowering stems. If needed, prune as indicated above by the end of August.